Mobvoi has just announced that its holiday offers will be revealed on November 22. However, customers who don't want to wait until next week can now grab the company's best-selling smartwatches for 20% off. Even Mobvoi's newest smartwatch, the Ticwatch C2 is on sale, but it's only 10% off until December 6. 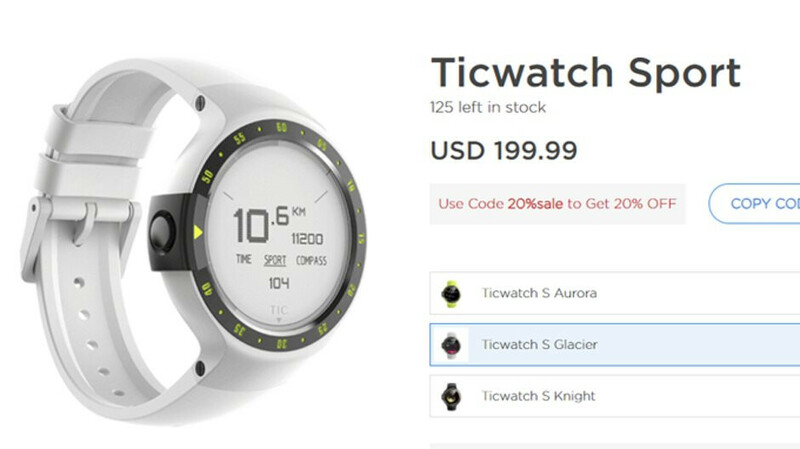 First off, you can buy the Ticwatch E for $30 off, so you'll only be paying $130 instead of $160. The smartwatch is available in three colors: Lemon, Shadow, and Ice. There's also a bundle available that includes the TicPods alongside the smartwatch, which sells for $270 ($20 off). Next in line, the Ticwatch S is available for just $160, so you'll save $40. Keep in mind though that you'll have to use the discount code “20%sale” at checkout to get the offer. This one is available in Aurora, Glacier, and Knight color flavors. The bundle that includes the Ticwatch S and TicPods is also on sale for $310 (20 off). And then there's the Mobvoi TicWatch C2 that's now available for $180 ($20 off), and the Ticwatch Pro which now comes with a free TicBand ($50 value). Check out Mobvoi's online store to choose whichever deal suits you best.